These chicken enchiladas make a meal suitable for the whole family. Make the sauce: In a medium saucepan, warm oil over medium low heat. Add onion, garlic, jalapeño, and chili powder. Cook until onions are translucent, about 8 minutes. Add tomatoes and 1/2 cup water. Season with salt and pepper. Bring to a boil, reduce heat, and simmer, crushing tomatoes lightly with the back of a spoon. Cook until tomatoes are tender and sauce is slightly chunky, 15 to 20 minutes. Add lime juice, and season with salt and pepper. Preheat oven to 450°. Make the enchiladas: In a medium skillet over medium high heat, warm tortillas, 10 to 15 seconds per side. Working with one tortilla at a time, top with 2 ounces of chicken, 1 ounce of cheese, and pickled jalapeños, if using; roll tightly. 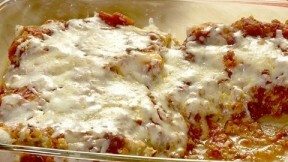 Place enchiladas, seam-side down, in a 9-by-13-inch baking dish. Pour sauce over tortillas, and top with remaining cheese. Bake until cheese has melted, 5 to 7 minutes. If desired, place under broiler for 1 to 2 minutes for a crispier top. Serve with sour cream and fresh cilantro, if desired.